I believe there's only one true criterion of stuttering. And it's not the number or severity of speech impediments. So what is it? 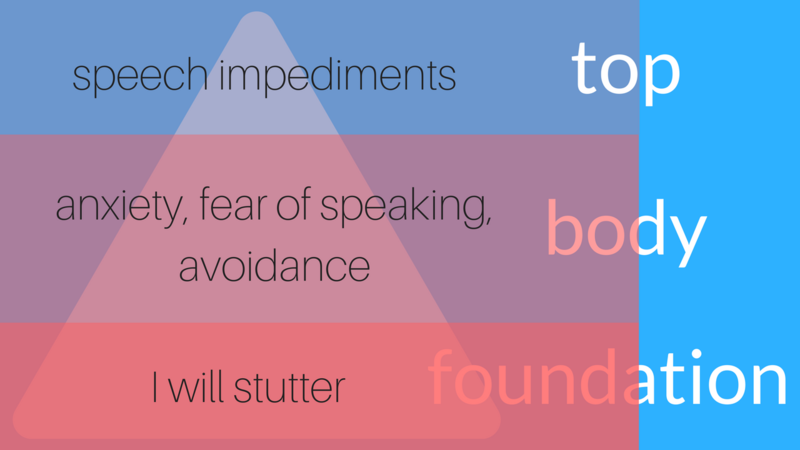 Stuttering is a pyramid or iceberg where everyone sees just the top of it, the speech impediments. Then under the water goes the main body, the trunk of it consisting of negative emotions, tension, fear of speaking, anxiety, avoidance behaviors. So, that's the body that other people don't see but that's a huge piece of it. At the bottom goes the foundation which is our fixation, firm understanding that it's stable, it's permanent, recurring and once we press on a button it launches that stuttering state. And it's not just a bare belief because it just happens this way. It's supported time after time by our physical and emotional experiences so that's something we see happening. That’s the foundation. For some people, it occurs every sentence they try to say. For some people, it comes just in some circumstances, high-pressure situations, new settings but it’s still the same pyramid, the same iceberg. In the speech that I took, I remember how we measured improvement or success in the therapy if you wish. There was a chart or table with three columns. The first was the number of speech impediments, the second was maintaining an eye contact and the third was a general confidence, how you behave while speaking. And yeah, I totally agree that these are great things for a medical definition of stuttering, but for me though as a person who stutters there's always been just one metric, one true measure of stuttering. And that is how I feel about it. I recently watched a couple videos with Elon Musk talking. He's a good speaker, but I noticed that he repeats words from time to time. In those moments, he has some speech impediments that we have. I have another video where you can see other great speakers having those speech impediments that we would go crazy about. But they don't stutter. How do they feel about it? First, they don't care, they don't bother, and they don't notice that at all. Second, they continue with confidence that they can say whatever they want to say without speech impediments and that creates a general feeling about their speaking, about their speech impediments they're having. We cannot change the way we feel about our stuttering but we can choose the course of action; we can choose what we do. Remembering Elon Musk, these are the two things we can work on. Remembering Elon Musk, these are the two things we can work on. I will start with the second because many people would say he doesn't care because he knows he can say what he wants to say without speech impediments and yes, technically that's true. So, let's start with the second. Can we improve? Of course, we can and there is nothing wrong with trying to improve. If you look at successful entrepreneurs, speakers, artists, singers, performer, leaders; they all try to improve. They all look for something new; they're open for some sort of personal development. There is nothing wrong with trying to improve. You can browse, google for that. You can start with free stuff. There are a lot of free videos out there. You can get inside my Improve Program (it's also totally free), and see whether it resonates with you. So, just try to find something that works for you. There is room for improvement for sure, but I would call it the second thing. The first thing is about what is your attitude towards stuttering. How much you focus on that and how you perceive yourself with stuttering. The approach that I don't care means what you really need to care about you as a person. What you actually say what you do in your life, what you are after in your life. How much you focus on that and how you perceive yourself with stuttering. 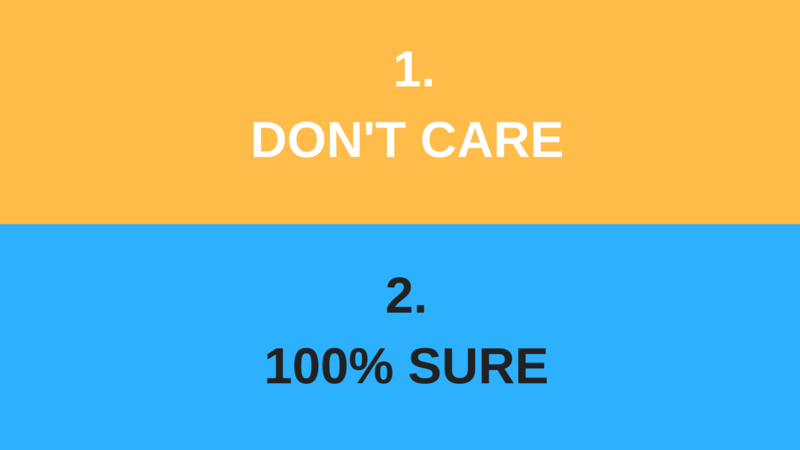 The approach that I don't care means what you really need to care about you as a person. What you actually say what you do in your life, what you are after in your life. This approach when you start doing what you want, start saying what you want that really turns it upside down. When despite your stuttering you do it; despite your stuttering, you approach that person, you make that call, you raise your hand. I would name it the first thing, the number one thing. As they say, the desire comes first and then you find a way, you find a tool. As a practical manner, I want you to go through a test. And it’s just a simple question. Probably there is some topic that you're interested in, that you want to talk about, that you like or hopefully even love. Imagine that there's an event, a conference about that topic, that particular thing that you love or you like or you want to talk about. So I'm asking you, would you like to come to that conference, to that event, (we'll cover all cost just imagine that) and talk about that particular topic. Give a 5-minute speech and then we'll discuss that and just ask you questions. Would you want to do that? Would you want to do that? What are you feeling right now? Can you just listen to your feelings and be transparent with yourself. How do you feel about it? What outweighs - your desire and joy associated with speaking on the topic that you love or the negative feelings, your fear and desire to avoid that experience? What is more important for you? I would love to know what you feel so please leave a comment.